Toshiba Asia Pacific was first established in May 1995 as Toshiba’s regional headquarter for Southeast Asia, India and Oceania operations. Apart from its head office in Singapore, Toshiba Asia Pacific has overseas offices in Bangladesh, Hanoi, Ho Chi Minh City & Yangon and overseas affiliates in India, Indonesia, Malaysia, Philippines & Thailand. Toshiba Asia Pacific, a subsidiary of Toshiba Corporation, provides support to Toshiba companies in the region with the strong focus to expand our business in the areas of industrial systems, power systems, social infrastructure systems, building solutions and industrial ICT solutions. Besides being responsible for Toshiba’s business operations in Southeast Asia and Oceania, Toshiba Asia Pacific also follows Toshiba’s commitment to creating a better environment and a better world for people everywhere. Principal Functions : Support as Regional Headquarters including regional administration, regional planning, branding activities, environment activities, financial administration, industrial systems, power systems, social infrastructure systems, industrial ICT solutions and building solutions. We, the Toshiba Group companies, based on our total commitment to people and to the future, are determined to help create a higher quality of life for all people, and to do our part to help ensure that progress continues within the world community. We endeavor to serve the needs of all people, especially our customers, shareholders, and employees, by implementing forward-looking corporate strategies while carrying out responsible and responsive business activities. As good corporate citizens, we actively contribute to further the goals of society. By continually developing innovative technologies centering on the fields of Electronics and Energy, we strive to create products and services that enhance human life, and which lead to a thriving, healthy society. We constantly seek new approaches that help realize the goals of the world community, including ways to improve the global environment. 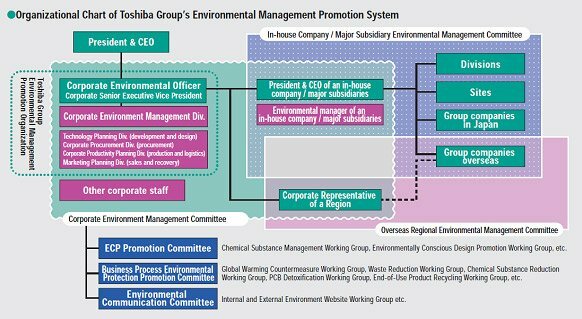 Singapore – Toshiba Group’s environment management promotion system in Asia and Oceania is composed of “Corporate Representative of the Region” and “Group Companies”. Corporate Representative’s functions of the Region are “organization of Regional Environmental network with Toshiba group companies”, “Confirmation and localization of corporate initiative”, “Plan and proposal of environment management promotional policy in the region”, “Support Group Companies for planning, doing, checking, action”. Regional environment management meeting is also set up to promote environment policy same as with other regions. 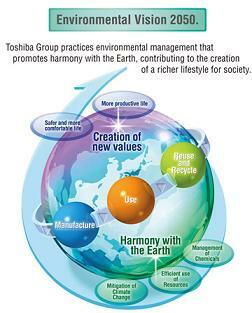 Moreover, we promote Toshiba group environment policy at the meeting of the group company’s representatives. Manufacturing company environment information exchange meeting that focusing value information exchange for workplace control policy is also set up to promote technical transfer in the region. TOSHIBA ASIA PACIFIC PTE LTD (TAPL) – Asia & Oceania regional headquarters under the TOSHIBA Japan have the mission to enhance customer trust in our brands in the market and to support the group companies in the region in environmental management, regional business planning, public relation advertising, power system, industry division, international procurement, innovation promotion, social infrastructure system, elevator and human resource and administration. In line with the Toshiba Group’s Basic Policy for the Environment, TAPL is committed to conduct all operations with minimal impact on the environment, and to comply with applicable corporate, environmental legislative and regulatory requirements; and to the extent possible, strive to excel towards continual improvement in environmental performance. Communicate this policy to all employees, key suppliers and contractors, and make it available to the public. Toshiba Asia Pacific Pte Ltd is a company providing internal supports to the Toshiba Group Companies and subsidiaries in Asia and Oceania Region. We are a Regional Headquarter expected to reinforce the overall efficiency of Toshiba Group Operations throughout the regions. We are seeking qualified candidate who is enthusiastic and thrive on challenges and is driven by a passion to succeed and excel to join us.